This article describes telemetry - the technology of collecting and receiving data from remote sensors or data collection systems. The market is exploding with new telemetry systems in the form Internet of Things (IoT) devices and billions of devices are being deployed worldwide. Telemetry provides the ability to access data from remote locations. Very often, these locations are difficult or expensive to get to and have limited access to power and physical networks. The IoT market is expected to be between $2.5 to $3.7 trillion worldwide. 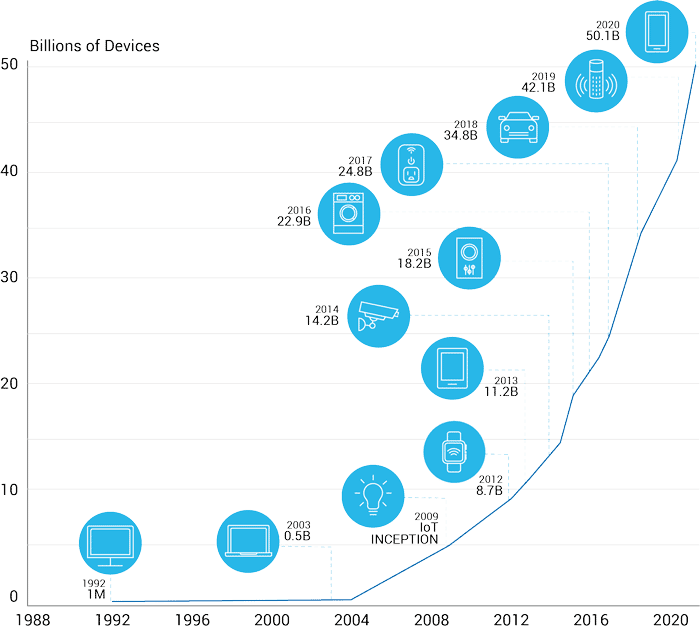 The number of IoT devices deployed will be over 50 billion in the next couple years of the publication of this article (2019). And the use of telemetry technologies has grown exponentially from 1850 to today. Low Power - Many IoT devices are powered from an embedded battery. New battery technologies have life expectancies of 10 to 20 years. Low-Code Footprint - IoT devices are required to be as small as possible. This requires lightweight protocols that do not need heavy computing or wireless transmission power requirements. Low Bandwidth - Higher bandwidth transmissions require higher power and additional hardware footprints. Local Intelligent IoT Gateways - The closer this system is to the IoT device, the lower the power required to transmit to this receiving system. IoT telemetry communications between the devices and the receiving system are performed by several protocols. Each protocol has benefits and flaws. MQTT - The Message Queuing Telemetry Transport (MQTT) protocol runs over TCP/IP and was designed for embedded hardware devices with limited embedded components and low power requirements. This protocol uses a publish-subscribe approach, which is inactive between transmissions and data retrievals. MQTT requires an intelligent IoT gateway. CoAP - Constrained Application Protocol (CoAP) was designed to run on devices constrained by low power and lossy networks. The protocol runs on UDP and is easily translatable to HTTP. CoAP can be routed over IP networks and supports IP multicast for M2M communications between other IoT devices. HTTP - This protocol is often combined with the Restful API protocol and is routable across the internet but is insecure. HTTPS - This protocol is secure and robust but has high power and processing requirements to encrypt data traffic and requires remote management of certificates. An IoT telemetry architecture includes the components shown below. IoT Devices - IoT devices are independent network nodes that communicate across IP networks or often directly with IoT gateway systems. M2M IoT - Protocols communicate with the local IoT gateway or alternately with central datacenter or cloud locations. IoT gateways communicate using secure and encrypted protocols. IoT Edge Security - IoT devices are exposed and vulnerable (by design) and require security technologies including firewall deep-packet inspection and others. IoT devices that have been compromised should be detected and quarantined as soon as possible. Edge security for IoT devices should be provided both at the IoT gateway and at the ingestion point of the central datacenters or clouds. Business applications that monitor and act upon the telemetry data. IoT data from multiple locations are analyzed centrally with a complete view of all deployed devices. IoT device management software systems that provide orchestrations, software/firmware updates, health monitoring and overall management. New IoT devices can be deployed and on-boarded with centralized systems.